The oil and mining industries, as well as other large-scale business operations such as agriculture, construction, and renewable energy, have the potential to bring benefits to countries and to communities, including economic development and jobs. However, these operations also have the potential of bringing negative impacts to communities, such as impacts on quality of life and the environment. Another potential negative impact on communities, addressed by the Voluntary Principles, is the risk of harm to the community based on the security that is provided to protect business operations. 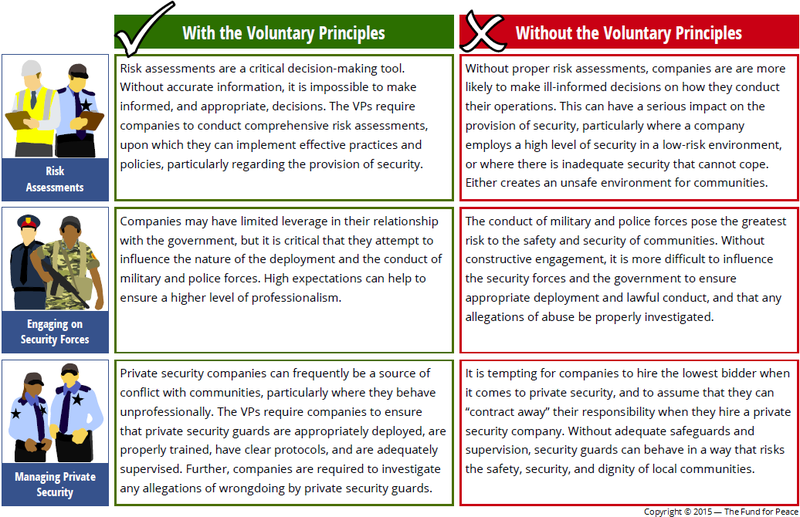 The Voluntary Principles outline expectations on companies regarding the manner in which they secure their operations, how they hire, train, and supervise security guards, and their engagement with governments regarding the deployment and actions of police and military forces in and around company sites. When security is appropriate, proportional, and predictable, and when guards and security forces are properly trained, supervised, and given clear instructions, the likelihood of security incidents is reduced, resulting in safer communities. The Voluntary Principles provide requirements and clear guidelines for how companies conduct their operations, particularly with respect to security. The provision of security at company sites is a regular occurrence worldwide, and can range from a simple guard at the gate, all the way up to armed public security forces protecting people, product, and property. 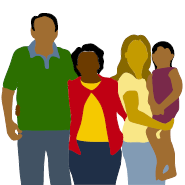 But as much as security is common, it can also be a source of potential conflict and abuse. The Voluntary Principles address this risk, and ensure that companies take every reasonable step in ensuring that the right security is provided, and that security forces act in a lawful, responsible, and respectful manner. The safety and security of communities should then be better assured. When security forces act inappropriately — through excessive use of force or simply disrespectful behavior — it can unnecessarily escalate the conflict cycle. The community can become angered and respond strongly, in some cases even violently. This can then escalate a situation further, causing security forces to respond even more strongly. Escalation of the conflict cycle poses a serious risk to the safety and security of communities. 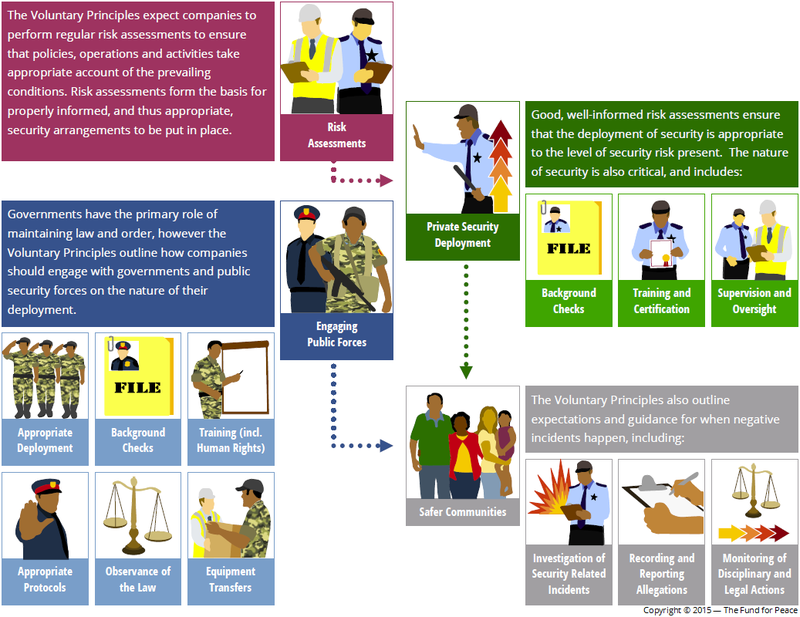 This resource is a simplified interpretation of the Voluntary Principles on Security and Human Rights. FFP assumes no responsibility for actions taken based on the content of this document. Before implementation of the VPs, as a whole or in part, is attempted, it is recommended that the official text be considered and that professional guidance be sought.